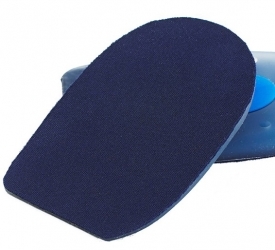 Gel Heel Wedges absorb impact and shock at the heel. Reduce heel pain with our superior shock-absorbing gel wedges. Absorb impact and shock at the heel of the foot while retaining their shape. Anti-microbial top cover absorbs odour and prevents bacterial growth. Removable spur plug for heel spur relief. Slim-line design is suitable for most footwear. Medium (M) fits shoe sizes 3 to 6. Large (L) fits shoe sizes 7 to 11.